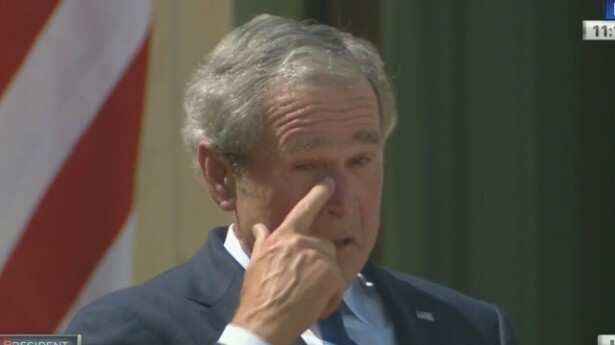 Former President, George W. Bush, publicly wept for the first time over Hurricane Katrina. Now listen, I'm not one to tell a person how he/she should react to a situation, but I'm pretty damn sure the victims of Hurricane Katrina would have appreciated those tears when they were going through one of the worse natural disasters this country has ever seen. Hell they didn't need tears. I'm pretty sure they would have just settled for some show of emotion. With a wink and a tear, the former president exited the stage. And then in response to the audience’s standing ovation, Bush wiped his eyes, cocked his head to the side, smiled and waved. I really hoped that people would let the man have his day yesterday. But I guess that was too much to hope for. Don't get me wrong, I was disappointed and disagreed with alot of what he did as president. It is no secret what many think of him and his presidency. He for sure is acutely aware of this. Nevertheless, he was our 43rd President and I just think that his critics could have bit their tongue for one day. Regarding New Orleans, he may very well be remorseful about how things went down. I think once again he is acutely aware of how his mishandling of Katrina stained his presidency. More recently I've just been annoyed with this incessant need to remind someone how much you dislike or disapprove of them. Letting him have his day wouldn't of erased all that occurred under his administration.